Click the button below to add the Gaiana Nutritive Soap #Gaiana# to your wish list. This beautiful handmade soap is rich in skin moisturizing plant oils and butters, which create a softening lather and help seal in moisture. Our Gaiana Nutritive Soap won't strip the skin like ordinary soap or leave it feeling sticky. This soap will gently cleanse and help nourish, moisturize and even the tone of skin. Pampers even the most sensitive skin and provides you with soft, supple, beautiful skin every day. 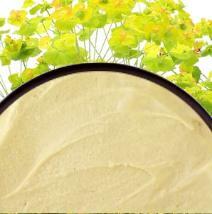 Avocado Oil conditions, nourishes and moisturizes the skin. Olive Fruit Oil is perfect for dry skin due to its fatty acid content, which helps moisturize skin. Do not let soap sit in water. Keep it in a dish and allow it to dry after each use. • Can be used as soap for the face and body. • Dampen the skin and use a clean damp cloth or clean hands to rub soap. • Apply your favorite moisturizer or lotion afterwards to hydrate skin. We suggest checking out our Nutritive Facial Lotion. I am presently using my third bar of Gaiana Soap. My skin becomes very dry during the cold weather. I have used several soaps, body washes and lotions to try and alleviate this without success. This soap leaves my skin soft and moist. I now use it all year. ASTONISHED WOULD BE AN UNDERSTATEMENT! I have used cream based facial cleansers for decades and was therefore extremely hesitant to use “soap” on my face but all I can say is I’m so happy I did! I’m 53 years old and had been using a popular facial regimen successfully for the past 11 years but rather rapidly my skin started to deteriorate. I developed dry discolored raised bumps, age spots and red spots that I couldn’t even cover with makeup, basically an overall unhealthy complexion. I started researching and found Just Nutritive on Pinterest but continued my research for three more weeks before placing my order. I was nervous and unsure but finally ordered the Gaiana Soap & the Anti-Aging Kit which included the Anti-Aging Facial Cream along with body cleanser & serum. I also ordered several other products including hair care all of which I will promptly review. The absolute truth is I shouldn’t have wasted those three weeks because these products are nothing short of AMAZING. I noticed the change in my complexion on day 2 of using this soap and facial cream, the red spots were gone! I’d only used the products for 6 days when I received my first complement on my complexion and my hair. Also notable, I’m allergic to everything but had no reaction to any of the products I purchased. You cannot go wrong with Just Nutritive… just order! I am a 52 year old woman who has been using this soap for 5 years and my skin looks like that of a 35 year old! The soap never leaves my face dry or tight like most soaps do I also use the Anti-aging Facial lotion along with the soap. These are the only 2 products I have used on my face in the past 5 years and my skin looks great plus it's a very easy regimen to keep up. After I would take my daily shower I would itch like crazy...I tried several soaps that did not work that would not irritate my skin. I happen to see JustNutritive ordered the soap and have been using it for a year or more. My skin is not dry and flaky, it soft and smoth.I l like it also because it has no fragrance to interfere with your cologne I absolutely love this soap, try it and you will fall in love with it too!!! Best Soap I Have Ever Used! I'm not going to lie. I have tried a LOT of products, but this soap, not only has a very pleasant smell, but leaves your skin squeaky clean. I have very sensitive skin and I'm less dry and itchy since using this. Will have to keep this well stocked! I have been dealing with a dry skin condition for about 6 months now. I've tried all kinds of products especially body washes with little relief. I decided to try this soap and to my amazement this product has cleared up my skin issue in less than a week of using. I literally saw big time results with just the first use. I definitely recommend this soap and will be ordering more. Just an FYI: Keeping the soap dry in between uses makes it last a lot longer. Well worth the cost if you have dry skin and want relief fast! My Skin Loves this Soap! Even though this soap is pricey, I can't resist getting it especially during the colder months. The wonderful oils in it are super nourishing and hydrating. Skin can get dry, cracked, and chapped pretty quickly in the Northeast, but this soap helps incredibly to prevent that. It smells lovely and leaves my skin soft and happy. I like this soap, I would have given it 5 stars, but they used to make one I liked better. I wish they would bring back the variety they used to have. They had one that was great, but since I can't get it anymore, so this one will have to be good enough. I like that it leaves no residue and it doesn't feel like your skin is shrinking when you get out of the shower. For awhile I have had uneven skin tone primarily on my knees and elbows. I tried everything to treat this with very limited success. After two months of daily use of this soap the uneven skin tone has started to fade. Now I feel confident to wear skirts and shorts out in public. Thank you Just Nutritive! Now I made this purchase when they had a coupon running so in my opinion its expensive. But regardless this soap is awesome and the difference is significant when using it. My skin feels so soft especially because I have very sensitive skin. I will say it doesn’t get all mushy or slimy compared to other natural products I have used.